Thank you for subscribing to The Wall Street Journal. Unfortunately, today’s Kindle Edition has been delayed. We are working with the Wall Street Journal to solve the problem and delivery your newspaper as soon as possible. Until this year, I subscribed to home delivery of the physical New York Times and Wall Street Journal newspapers and only wound down those subscriptions once I bought a Kindle. There are, of course, limitations to Kindle-based news subscriptions. You can “clip” articles, but try sharing them. Done reading this edition? You can’t pass it on. And despite Whispernet and the Kindle’s persistent network connection, news content still arrives just once per day. But there are obvious advantages to Kindle news, too. An important one for me was the reliability of the delivery system. The fate of news delivery is no longer in the hands of pedal-pumping paperboys, which is probably for the best. Paperboys have a bad reputation, and it didn’t all spring forth from the video game. I know what kinds of delinquents can get these jobs because I was one of them. 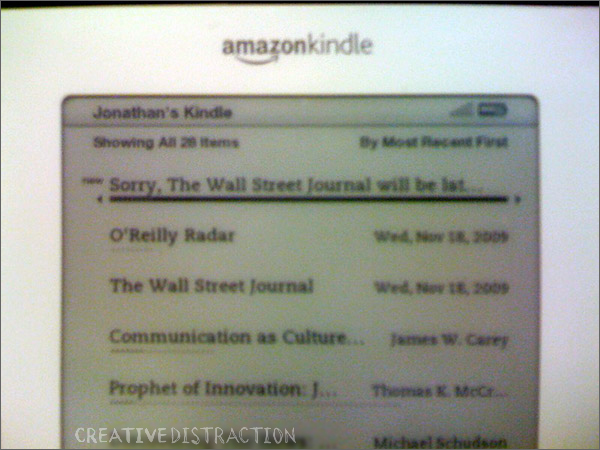 Apparently, this “one-off glitch” with WSJ Kindle Edition has happened before. If it happens too much, Kindle-owners might just look to get a new boy on the route.